From the kitchen of One Perfect Bite...Despite his surgery, the Silver Fox is back in fine fettle and it will not be necessary for us to scrap plans to travel through South America in the fall. Most of our time will be spent in Peru and I am embarrassed to admit that I know next to nothing about the food of the region. I've started to research the cuisine and I am in rudimentary stages of testing recipes that I think are typical of the area. I did a soup several weeks ago that we really enjoyed and I've been collecting recipes ever since. While it is usually spit roasted, the Peruvian chicken featured in this post is a classic entree. I first saw it on Foodspotting. 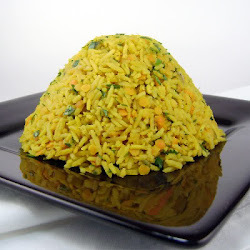 It is a popular dish and always on the menu of Pio Pio, a chain of Peruvian restaurants in the New York area. Unfortunately, I was unable to get a copy of the recipe they use to prepare the chicken. I did, however, find one on Sara Moulton's website and I must tell you I'm thrilled with the results. This dish is about as easy as they come and you'll have no problems with it, if you make sure the chicken is dry when you put it into the oven to roast and you make no attempt to baste it. The end result is a wonderfully flavored chicken that has glorious color and skin so crisp it crunches when you bite into it. The green sauce, aji verde, is a must. It has some heat, but I can't imagine this dish without it. I would suggest you substitute 1 large sliced jalapeno for the serrano chile called for in the original recipe. It will tame the dragon's fire the serranos might cause. The ease with which the chicken and sauce come together, guarantees this healthy entree a spot in my recipe rotation. Please try this one. I promise you won't be sorry. Here, thanks to Sara Moulton, is the recipe. Enjoy! 1. Combine the cilantro, soy sauce, vinegar, vegetable oil, cumin, paprika, oregano, and the desired amount of cayenne in a blender; press in the garlic (about 2 tablespoons) and puree for the marinade. Combine the marinade and the chicken in a resealable plastic bag and set aside at room temperature for 30 minutes, turning the bag once. 2. Place an oven rack on the top shelf of the oven and preheat the oven to 450°F. Drain the chicken, discarding the marinade, and pat the chicken dry. Arrange the chicken on a rack in a shallow roasting pan. Roast for 20 to 30 minutes, or until crispy and cooked through. Let rest for 10 minutes before serving. Top each portion with green sauce. Yield: 4 to 5 servings. Green Sauce: Combine 3 large scallions, trimmed and halved, 1/4 cup sliced Serrano chile with seeds and ribs (I suggest substituting 1 large jalapeno for the Serrano chiles), 1 tablespoon fresh lemon juice, 2 oz crumbled goat cheese (1/2 cup), 1 tablespoon vegetable oil, 1/2 teaspoon salt, 1/4 teaspoon black pepper, and 1/2 cup half-and-half in a blender and puree until smooth. This sauce sounds delicious, Mary. We visited Peru a few years ago and I'd love to go back. We ate our way all around Cuzco and through Lima - tried llama and guinea pig too. Whenever I had chicken, it was very good, and the seafood in Lima was outstanding. I hope you have a wonderful trip! This sauce is the most lovely pale green!!! That chicken with green sauce looks really tasty ! I love all the wonderful spices in that Peruvian dish ! This looks delicious, I am ignorant on Peru cuisines too! 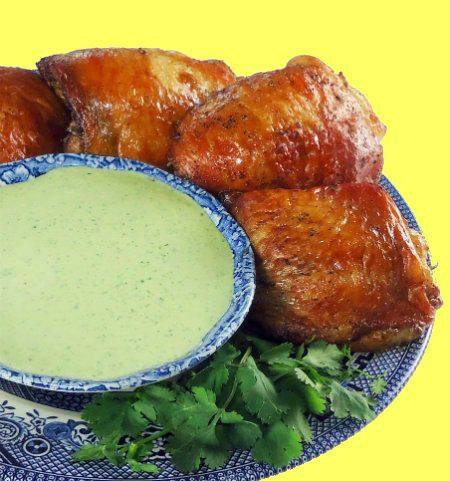 This Peruvian Chicken with Green Sauce looks really good, something that I would love to try! Have a nice day! I love this sauce!Have a lovely day,dear Mary! The chicken and the green sauce looks both yummy! 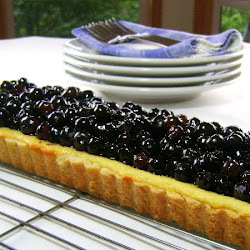 I'm bookmarking this recipe for sure, it's perfect for summer! I'm a nut about cilantro so I know I will love this. How fun to look forward to a trip to Peru - I'm sure you will be an expert in their cuisine by the time you return! Great recipe - the ingredients and flavors are making my mouth water! Oh, this looks divine... and sauce...Oh Yum, the sauce!! I think you know I will be trying this one very soon. It sounds wonderful! I love this green sauce. I can't wait to taste it. Interesting and succulent chicken with yummy sauce, wish to eat anytime. It looks delicious! My son was a missionary doctor in Peru for almost seven years. I had a wonderful three week visit with him and his family while they were there. They had a very nice Peruvian cook who made authentic Peruvian dishes each day, and my daughter-in-law also learned to cook Peruvian food. Most of it, I liked. I hope you have a wonderful time. Peru is an amazing place! Be sure to see Machu Picchu! Mary, that chicken dish sounds terrific! I always loved Sara Moulton and am so happy to hear your praises of this recipe. I loved Peru and actually met my husband there! I look forward to trying this recipe out. I bookmarked it! I'm glad he's feeling better! How exciting to have these traveling plans in front of you...What fun! The green sauce sounds like something I would definitely like...looks good! Hope you have anice trip take care Mary! I'm particularly attracted to the green sauce. The chicken recipe looks delicious as well. Digging the green sauce! Will love to try how this sauce tastes. You know Peruvian cuisine is very trendy everywhere in Latin America at the moment... you're going to love it! I am currently living in Lima, and would love to show you around! drop me a note on loqueanacocina@gmail.com and I can give you loads of advice on where to eat, what to do and stuff!